Butter London is launching new cosmetics including a few more shades of polish! I have my eye on Jaded Jack (opaque lime green cream) & Brown Sugar (opaque copper shimmer with gold glitter) but today I have Indigo Punk. You’ll be able to purchase these new items including colored mascaras, eyeliners, & lippies from Ulta & butterlondon.com on August 1st. I love this shade & I don’t have anything quite like it! Keep reading to check out swatches! 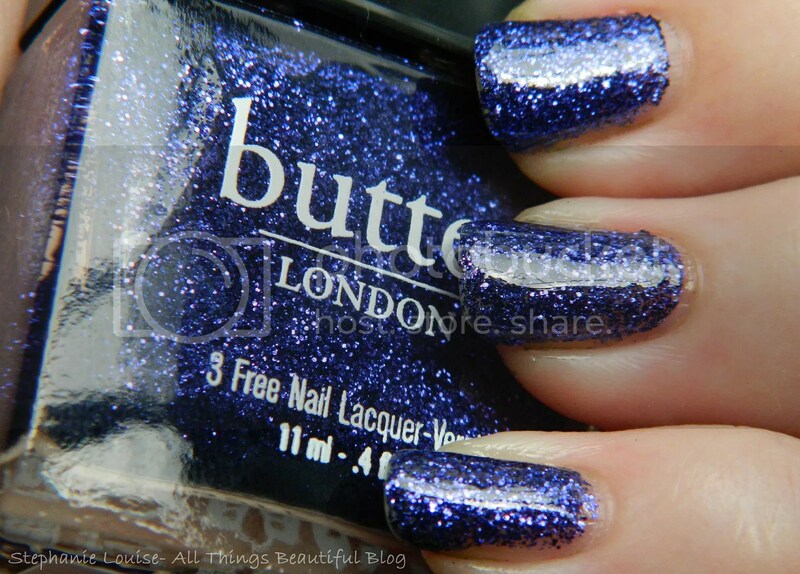 Butter London Indigo Punk- A combination of indigo extra fine hexes & extra small hexes. 2 coats. I used Seche Vite to really make it shine but this glitter is so fine & small that it really isn’t all that gritty. I love indigo & I’d say this one leans a bit more purple than blue. I absolutely love it & was shocked when it only took 2 coats. Impressive. Like I said before you’ll be able to snap this baby up August 1st. I think it is definitely a great topper or accent nail. A bit purple…a bit blue…& glittering. What do you think? Are you an indigo fan as well? What new shades are you looking forward to?